I am urging the Department for the Environment to approve plans to restore old Cultra Railway Station with the Planning Application now delayed by 15 months due to bureaucratic red tape. Late in 2012 Cultra Railway Station was given a lifeline when local man David Crowe purchased the building. The disused Railway building had been under the control of Ireland's 'bad bank' NAMA. Sale was made possible after a concerted campaign to Save Cultra Railway Station House involving Councillor Larry Thompson, myself, NI Environment Agency, Holywood Conservation Group, Ulster Architectural Heritage Society, local residents, businesses and Dominic Hannigan TD. Once purchase was completed plans were then submitted to restore and renovate the listed building in May 2013 but over a year later approval has still not been granted. Plans submitted involve much less housing density compared to previously approved plans which squeezed four apartments into the Railway Station building. After lots of hard work I was thrilled to see the Planning Application submitted in May 2013 but 15 months later I am bitterly disappointed that the Department for the Environment have not yet approved the plans for restoration and renovation. Again and again new barriers emerge which the applicant has to navigate, often at considerable expense. Last year it was a fear of ground contamination but after an expensive survey and meeting convened by me when Mayor this issue was eventually resolved. Then we had concerns about a wall and now, most recently, requirement to undertake a bat survey. With hundreds of pounds now spent to prove that bats will not be adversely impacted the application is still pending with no approval date on the horizon. I am profoundly disappointed these issues were not raised shortly after the application was submitted. Instead of the application being promptly processed the applicant has experienced a slow drip feed of queries and delays which is entirely unacceptable. I have written to the Environment Minister Mark H Durkan MLA and in his reply he details “I have asked my officials to expedite the processing of the application so that a decision can be reached as soon as possible”. This, I hope, means that Planning Service will soon get everything back on track with approval given in the next few weeks. We need to be proceeding full steam ahead without any more delays or risk that the entire application could hit the buffers. In order to protect and preserve our Built Heritage we need an efficient and effective planning system that encourages and enables owners to easily refurbish and renovate listed buildings. Without such we risk losing some architectural gems in the midst of bureaucratic red tape. I therefore hope that lessons can be learnt from this series of unfortunate events and the application is approved very soon. 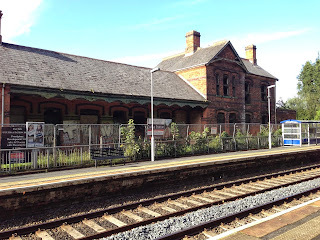 Cultra Station House was designed by renowned architect Charles Lanyon, built in circa 1863 and listed in 2007 when threatened with demolition.